The famous Crab Nebula supernova remnant has erupted in an enormous flare five times more powerful than any previously seen from the object. The outburst was first detected by NASA’s Fermi Gamma-ray Space Telescope on April 12 and lasted six days. The nebula, which is the wreckage of an exploded star whose light reached Earth in 1054, is one of the most studied objects in the sky. At the heart of an expanding gas cloud lies what’s left of the original star’s core, a superdense neutron star that spins 30 times a second. With each rotation, the star swings intense beams of radiation toward Earth, creating the pulsed emission characteristic of spinning neutron stars (also known as pulsars). Apart from these pulses, astrophysicists regarded the Crab Nebula to be a virtually constant source of high-energy radiation. But in January, scientists associated with several orbiting observatories — including NASA’s Fermi, Swift and Rossi X-ray Timing Explorer — reported long-term brightness changes at X-ray energies. Scientists think that the flares occur as the intense magnetic field near the pulsar undergoes sudden restructuring. Such changes can accelerate particles like electrons to velocities near the speed of light. As these high-speed electrons interact with the magnetic field, they emit gamma rays in a process known as synchrotron emission. To account for the observed emission, scientists say that the electrons must have energies 100 times greater than can be achieved in any particle accelerator on Earth. This makes them the highest-energy electrons known to be associated with any cosmic source. Like a July 4 fireworks display a young, glittering collection of stars looks like an aerial burst. 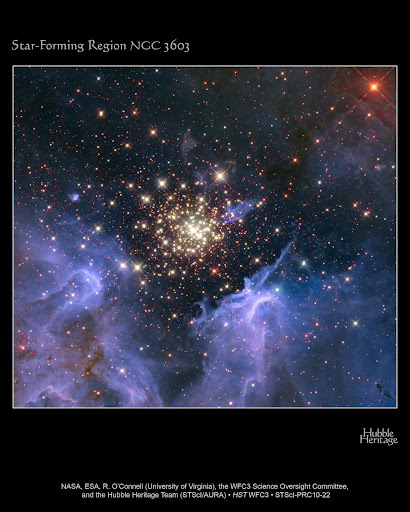 The cluster is surrounded by clouds of interstellar gas and dust – the raw material for new star formation. The nebula, located 20,000 light-years away in the constellation Carina, contains a central cluster of huge, hot stars, called NGC 3603. This entry was posted in Crab Nebula. Bookmark the permalink.